The definition of ‘trio’ spans such distant extremes, from nuanced, chamber derived line-ups to rave, aggressive, even electronic outbursts, to have become such a mysterious formula for success in jazz music. Giving the most iconic trio line-up is the piano trio, electric trios in jazz and fusion have been often labeled as ‘power trio’ thus indicating a different league of their own and placing them on the other end of the spectrum: thunderous, driving, rock-oriented grooves and the prejudicial belief electricity brings less attention to detail. Preston Glasgow Lowe trio is exactly undermining this opposition between the two ends of the definition, working the power electrified trio as if they were a piano trio, with subtle attention to smallest details, shining the surface of their hard-edged and rumbling music. There’s an inner sense of intimacy, even when their music becomes frenzy, sharper and virtuoso oriented, that pervades the second recording of this trio. Something About Rainbows follows up the debut album David Preston, Kevin Glasgow and Laurie Lowe released in 2016, named after their last names. The three of them are rising stars in the sparkling British jazz scene and have already a wealth of an experience in playing with renowned artists: the guitarist David Preston worked with Melody Gardot among others, the bassist Kevin Glasgow has gained exposure with British jazz elders such as Tommy Smith, Tim Garland and master drummer Asaf Sirkis, while drummer Laurie Lowe played with Gilad Atzmon, another jazz elder as Andy Sheppard and Nicolas Meier among the others. 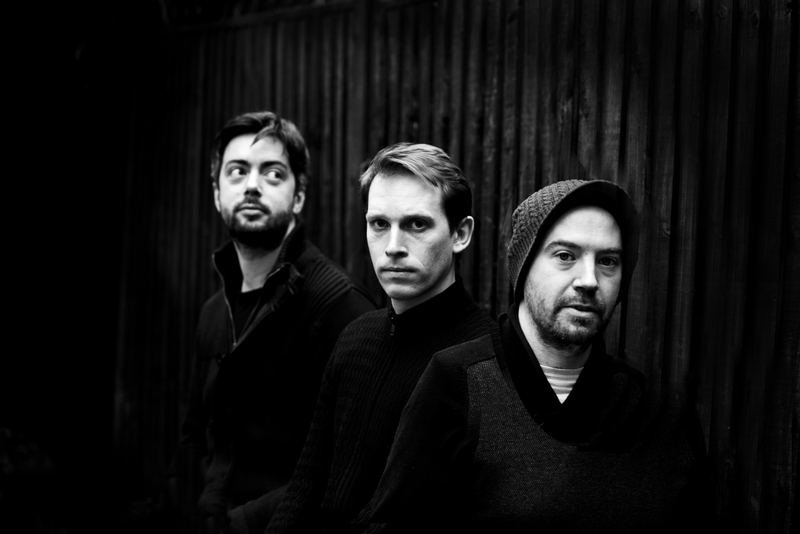 The trio formed in 2012 and soon released a three-songs EP, which showed immediately an impressive array of virtuoso techniques by all the three of them. Preston showing polished and impressively fast licks on a clean Gibson guitar tone, Glasgow contributing with its impressive use of guitar-derived techniques such as tapping and sweeps and Lowe adding frenzy polyrhythmic hysteria. This jazz fusion influenced set of rules is still there after they released their debut album for Whirlwind records. Going in retrospect, the trio has changed much under the surface of their sound, working a lot -they released their debut only four years after they formed- to progress the interaction between the three. While the virtuoso element is still the main thing in Preston Glasgow Lowe, yet the second release seems to take a leap further. As we toured our first album, we were actively exploring new material and discovering a greater harmonic, rhythmic and dynamic range, explains Preston. So alongside the heavier, metal-rock feel – more full-on now than anything we’ve previously created – increasingly delicate and conceptually open expressions appeared, so consequently the new compositions feel more pristine yet a lot freer, each having its own feature. There’s so much happening in the initial minutes of Fumes: the shimmering chord intro, seemingly an etude in II-V-I cadences by David Preston, is brilliantly counterpointed in polyrhythmic additions by Kevin Glasgow and playful rimshots by Laurie Lowe. When the guitar moves to a descending arpeggio theme, cymbals are joyously answering. Then the two themes are repeated with small variations allowing again Glasgow and Lowe to revert the scene once more from a different angle and putting in place a completely new set of solutions. The change of tonal center that prepares for the more improvised second part of the tune is only partially dedicated to the individual solos, with Preston hinting to small excerpts rather than standard soloing until the ending closure by Lowe. The warm and leading voice of Glasgow plays a pivotal role in the initial track at times playing with a behind the beat feel, that sits somewhere in the middle between a latin and funky feel. David Preston‘s playing is not concealing his admiration for guitarists such as Pat Metheny and Kurt Rosenwinkel: his distinctive voice is often made by a melodic usage of a warm clean tone with very few effects, maybe some reverb and barely hearable delay at times. Then he likes to add occasional distortions or bits of other effects that still make evident the sound underneath. Still he is deeply influenced by a guitarist so different from the previous ones, like Allan Holdsworth, and by his masterful usage of extended legato techniques. The title track is a tribute to old 80s fusion and the guitar tone is added with extra raw distortion. Preston starts the initial convoluted chord voicings that put an ambiguous tonal environment in place, enhanced by Glasgow‘s fuzzed funk bass and by Lowe playing a driving Cobham-style drumming. Differently than initial track, this time Preston takes a personal solo for the majority of the piece. The four initial notes of his stint immediately put it in a typical Holdsworthian atonal environment, until it grows bigger and bigger and finally explodes with an impressively executed flow of legato and sweeps. Truex is another highlight of the album: a doubled notes pattern over a sort of laid back feel imbued of electronic influences -reading the name of Boards of Canada wouldn’t be surprising here- shows how well they are able to move on the edge between acoustic flavor and electric influences, still retaining their trio approach. Similarly works Beat 5: a four-beat rhythm with an odd rhythmic feel in five beats, that David Preston initially composed on a sequencer, excites Lowe‘s accelerating and decelerating. The guitar’s sound is so pristine and crystal clear to play a contemporary pop ballad through the lens of impressive trio dynamics, again supported by the harmonic wisdom of Kevin Glasgow. The closing track restores an apparently more austere mood. The serial theme of HWH, that Kevin Glasgow plays in unison with David Preston, was composed by the bassist after composer Hans Werner Henze, whose initials make the name of the tune, and seems to recall an atmosphere similar to some Ben Monder‘s atonal explorations. The track goes wild while still keeping an intimate feeling: David Preston starts a meditative solo that eventually fades in a couple of minutes to suspended chords. The initial theme, now slowed, comes back in for tapestry of Kevin Glasgow intense solo. A mature approach showing a depth of solutions and details, Something About Rainbows marks a leap forward for Preston Glasgow Lowe trio. Using an enriched bag of tools, where virtuoso is now declined in a more flexible way than it was in the past, they are now reaching an higher level of exploration, of detailing smallest nuances that puts them in between between jazz and fusion with a very distinctive voice.